WorldTour teams Belkin, BMC, Cannondale, Garmin-Sharp, Omega Pharma-QuickStep, Orica-GreenEdge, Giant-Shimano and Sky will all field teams at this year’s Prudential RideLondon-Surrey Classic road race on Sunday, August 10. The eight top-level squads are among the list of 25 teams announced by the event organiser on Thursday, which also includes six Professional Continental, 10 Continental and one national (Great Britain) team. The riders will face a 200-kilometre route starting in Queen Elizabeth Olympic Park, London, and then heading out towards the Surrey Hills before looping back into the capital to finish on The Mall. “We have attracted a strong line-up and an excellent combination of teams, some of whom will be working towards a sprint finish while others will be looking to animate the race and ride aggressively,” said RideLondon-Surrey Classic race director Mick Bennett. The race will be broadcast live on BBC One. 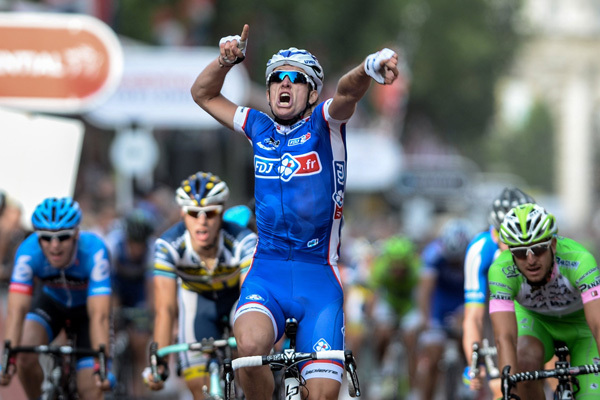 Last year’s RideLondon-Surrey Classic was won by Frenchman Arnaud Demare of FDJ, who will not be riding this year.